Certain foods are meant to be eaten together to bring out their nutritional benefits in the best way possible. According to our LaurenConrad.com nutrition expert Shira Lenchewski, RD, the term “bioavailability” is a fancy word used to describe how easily a nutrient is broken down, absorbed and utilized by the body. Foods can work together to enhance this bioavailability, allow nutrients to become more powerful and efficient in our bodies. Today I will be sharing 10 food combinations that are better when eaten together. Just think of them as extremely healthy relationships that do a body good. Why do tomatoes go so well with guacamole (besides tasting great, of course)? Tomatoes are rich in a cancer-preventing antioxidant called lycopene, which makes them what we call a “carotenoid.” And healthy fats, like the ones found in avocados, are able to basically pick up carotenoids from the stomach and disperse them throughout the body. This cancer-fighting combo goes great in a big colorful salad like this one, so eat up. Sweet potatoes are loaded with vitamin A, which plays a key role in maintaining healthy skin and hair. 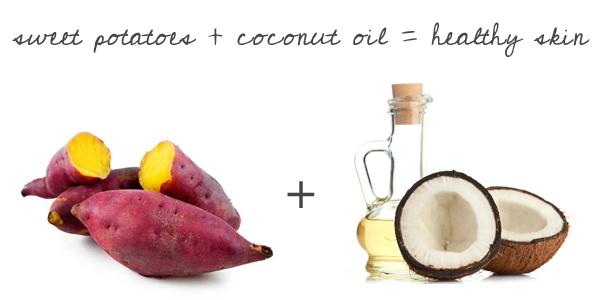 Shira says, “Vitamin A is absorbed more readily when paired with a fat source like coconut oil.” Cook up baked sweet potatoes fries using coconut oil and you’ll be glowing in no time. This combination of complex carbs and healthy fats is great for breakfast, or as fuel for an endurance workout. 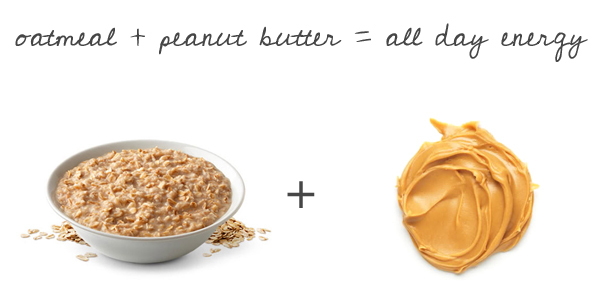 The complex carbs from the oatmeal keep you going, and the fats from the peanut butter help stabilize blood sugar. Talk about a breakfast of champions. Chocolate lovers…rejoice! 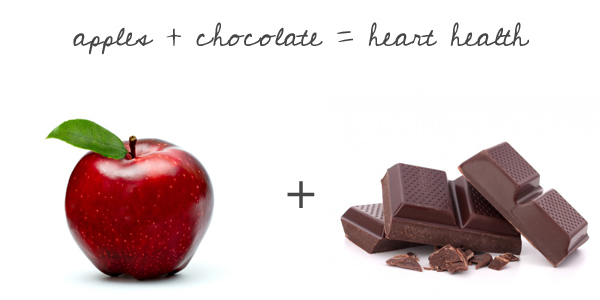 Apples and chocolate go so well together because they each contain flavonoids that, when combined, improve cardiovascular health. Raspberries can be substituted for apples in this case, so keep this sweet fact in mind the next time you’re debating whether or not to indulge in dessert (hint: the answer is yes). According to Shira, citrus fruits like lime provide high levels of vitamin C, which makes the plant-based iron in foods like black beans easier for your body to use. The moral of the story? 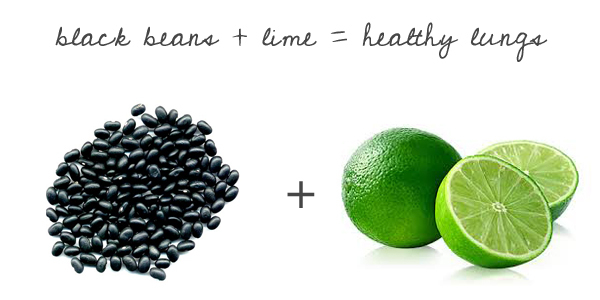 Order your tacos with black beans and a hint of lime for healthy cells and lungs. Fat-soluble vitamins A, D, and E are activated and absorbed when eaten with healthy fats, like the ones found in almonds. Yogurt is a great source of Vitamin D, which helps repair and strengthen your bones. 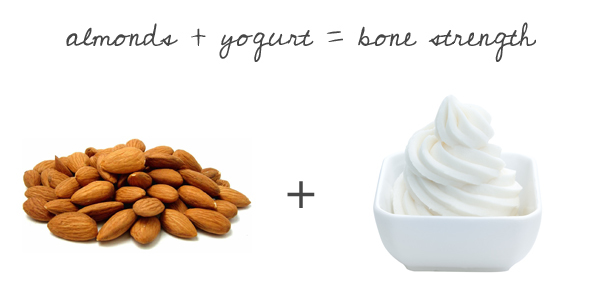 So tossing a few almonds in the next time you snack on yogurt will keep your bones stronger and healthier than ever before. This pairing is the perfect afternoon-slump snack. 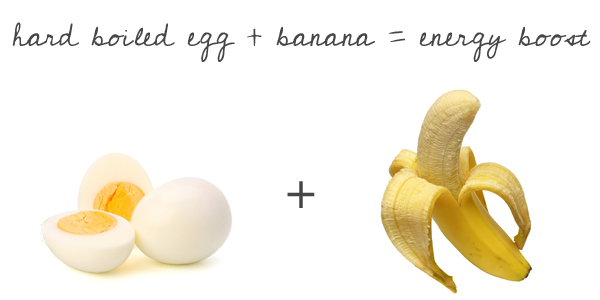 The healthy sugars from the banana deliver a speedy energy boost, while the healthy fats and protein from the egg keep blood sugar levels from spiking. You will be pleased to learn that your favorite kale salad has probably been boosting your immunity and improving your muscle strength all this time. When you add a squeeze of lemon juice to leafy greens like kale, spinach and Swiss chard, it causes a chemical reaction in your body that helps absorb iron in those leafy greens, which will in turn stave off muscle fatigue. 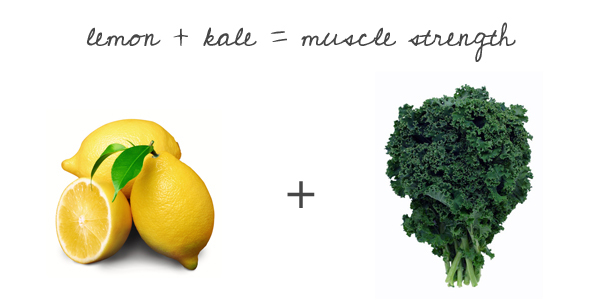 The next time you’re craving a salad post-workout, be sure to add a squeeze of lemon to your greens. 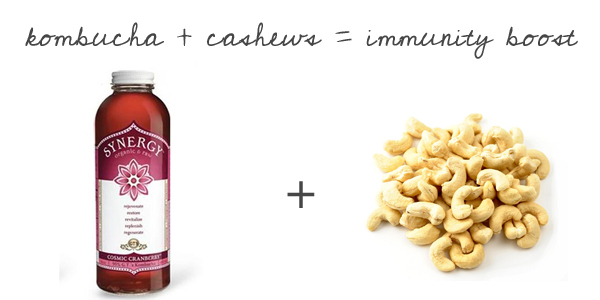 Snacking on cashews is a great way to get a boost of protein and of zinc, which functions as an immune booster. And, according to Shira, studies show that fermented products like kombucha help improve the absorption of zinc in the gut. That makes this immune boosting combo an ideal snack on the go! It’s no surprise that these two flavors are a match made in heaven, and they’re heart-healthy too. Cooking fish with garlic enhances the cholesterol-reducing properties in fish oils more than if it’s prepared sans spices. 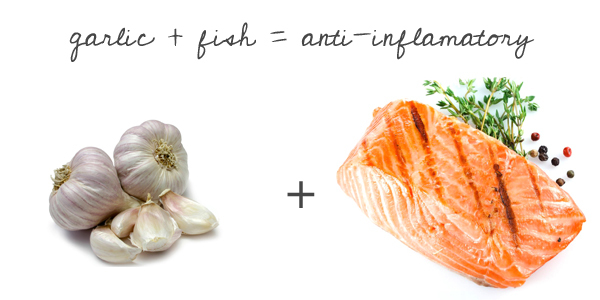 And when these two are combined, the garlic can act as an anti-inflammatory agent, as well. It’s pretty interesting how the foods that taste so great together are actually meant to be combined. Be sure to Pin the image above and pull it up the next time you’re planning out your weekly meals. 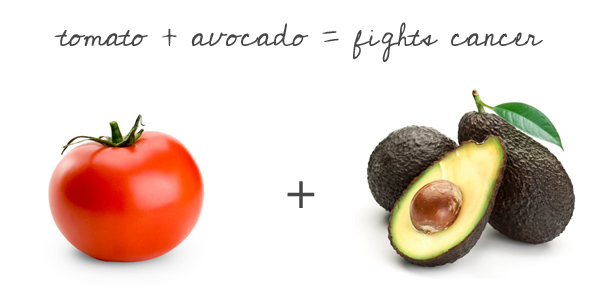 What’s your favorite of these powerful food combinations? And thanks again to Shira for sharing her expert tips with us! Healthy Habits: What Are Adaptogens?